Two modes of transport infrastructure have been influential in the settlement patterns east from the city of St Albans: the main road between St Albans and Hatfield, formerly a turnpike road; and the former branch railway between the same two towns. 1924 map with few homes, some prepared plots and much remaining woodland. Courtesy HALS. use of the space as it is developed, including appropriate road layouts. Development eastwards from Ashley Road began in the 1920s with the sale of that part of Hill End Farm squeezed between the road and railway, and this is when the problems began. In a period before modern planning, plots of varying widths were set out and potential householders were able to select an appropriate site to suit the size and design of house they wished to build on it. So, between 1922 and 1939 the south side of Hatfield Road gradually accumulated a variety of new homes, a high proportion of them over-looking fields opposite, which were perceived to be protected from development, as Hertfordshire County Council had acquired Oaklands Mansion and its home farm as recently as 1920 for the Hertfordshire (Oaklands) Agricultural Institute. Not so lucky were the new house owners between Ashley Road and Longacres (although that road had not been laid until the late 1930s). When they first moved in, they too overlooked farmland on the north side of the road. But all that came to an end in 1929 when the remainder of Beaumonts Farm was sold and houses quickly arrived all the way from Beaumont Avenue to the freshly laid Oakwood Drive. The 1924 OS map still shows plenty of woodland east from Colney Heath Lane. A number of homes have been built, and on the spare plots were built Cranbrook Drive, Charlotte Close and Ryecroft Court. The now partly diverted footpath to the former Butterwick Farm crosses to the west of Butterwick Wood. The line of houses on the south side, though fragmented to begin with, was otherwise unassumingly normal. But further east the frontage development had a slight flavour of frontier settlement about it, with its irregular spacing between unused, weed-infested plots and a variety of un-coordinated house designs, including a few of the small square bungalows reminiscent of seasonal accommodation put up at east coast resorts. Take-up was proportionately slower the further east inquirers looked; the key question being how far will it take to walk to the nearest shops. On the other hand, as the thirties progressed, more people owned cars, so distance from a hub – such as the new Oaklands shops – was less restrictive. 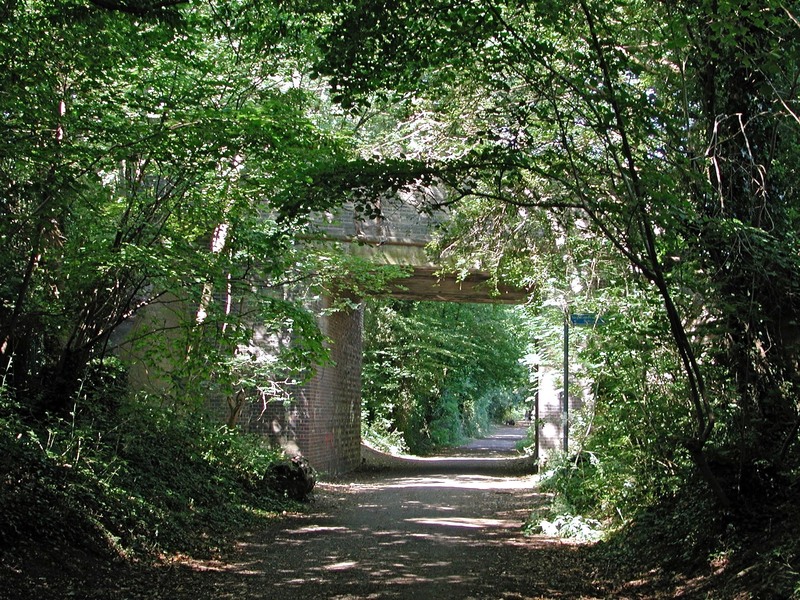 The question of backland development began to be tackled early on, at points where existing roads crossed between Hatfield Road and over the railway to roads on the more rural south of the railway. The first backland developments were easy ones at the Willow estate c1931 and the Firwood Avenue estate, begun c1937 and then extended in the 1960s. Both of these schemes are described below. Attempts to access the backlands in other places are entirely post-war and often involved some demolition of existing homes, as we shall discover. The Willow estate, off Ashley Road, was the only development not part of Hill End Farm. Here the land was part of Beaumonts Farm. It had been sold to Graham Fish of Oaklands, remaining in his widow’s property portfolio after his death. 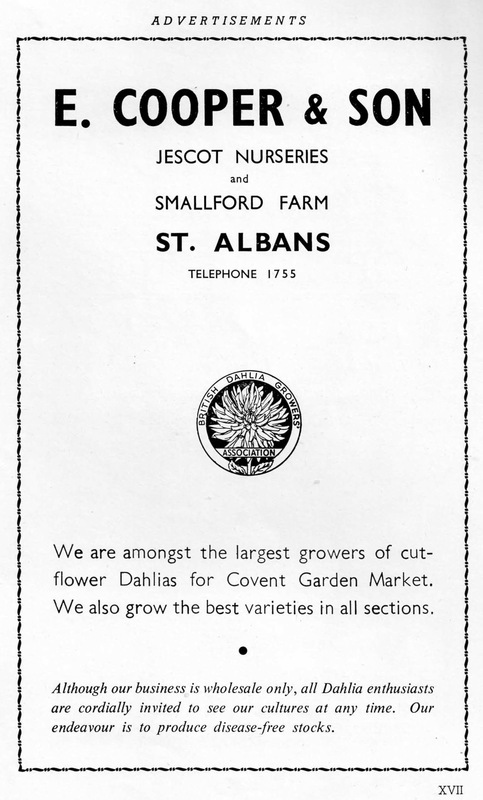 Along with the other remaining parts of the farm it was brought to market in 1929 by Watford Land. It was an attempt to manage the awkwardly accessed land between the Hatfield Road properties and the branch railway. Watford Land was not in a position to develop deeper eastwards as the boundary with Hill End Farm was the limiting factor. 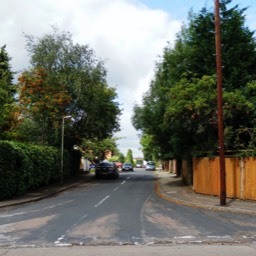 An omega-shaped group of roads was designed to enable the maximum number of houses to be included, but Oakdene Way offered a possible future extension by being laid right up to the boundary. Although there are four differently-named roads (Oakdene Way, Willow Crescent, Linden Crescent and Ashley Road) there is a single numbering sequence between them. A small triangle of land in the south-east corner was not built on, but again, the possibility of doing so in the future was left open as a branch of Linden Crescent was left open. Seven further homes were added c1970. of the residential roads on the 1929-sale Beaumonts Farm (but not the earlier sections). 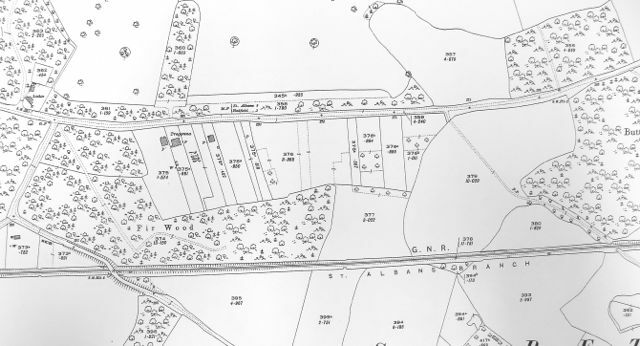 On the OS map dated 1924 Hardy House, Hatfield Road is located near the north-west corner of a field extending southwards to the branch railway. 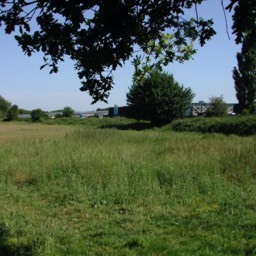 On the west side of the field was Chalkdell Wood, and to the west of here was an unofficial pathway – a short-cut between Station Road (Hill End Lane) and Hatfield Road. Although in 1924 no activity was marked on the field this was the location of the Hill End Brickworks, shown on the 1937 map – by when, in fact, the brickworks had closed! By 1937 Chalkdell Wood had been felled and the road laid as far as the railway line, although it was not made up until the 1950s. Numbers 1 to 23 and 2 to 16 were built and occupied by 1938, although 9 and 11 were demolished in the 1960s to allow for Cedarwood Drive to be cut through. Six bungalow homes were built post-war on the even side. Marconi Instruments acquired the site of the former brickworks and developed its electronics works here. Seven parallel plots lay behind Hatfield Road to the west of Longacres, the largest of which was rented by Ernie Cooper, a dahlia specialist, as one of his trial grounds. But there were other smallholding users too, including a WW2 pig club. When Longacres was laid out it was presumably anticipated that these plots would eventually be developed, as a break in the kerb-line was left in two places. The northern one was more-or-less in line with the end of Oakdene Way and although no development has taken place exactly here a short stretch of the road at the Longacres end is named Oakdene Way. The next section describes a later development. 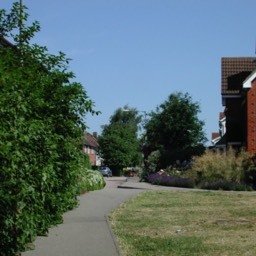 As stated above, the road line for Oakdene Way did not make a satisfactory layout for a house-building development, but the rear gardens behind Hatfield Road were extremely long, and were difficult for many householders to manage. During the mid-1950s house-holders were approached by a developer for permission to acquire approximatley 50% of the rear gardens. Some occupiers agreed, but it took nearly a decade before all the plots had been acquired. 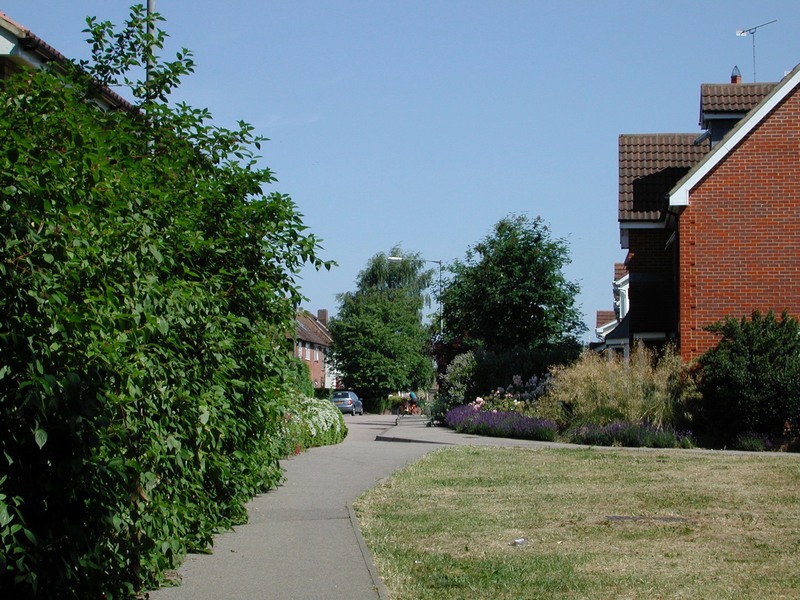 There was sufficient space for an access road, Pinewood Close, to be laid and terraces of six homes each to be built on the south side, up to the line of Oakdene Way. There was insufficient width to enable development on the north side. This probably suited residents of Hatfield Road; Many gradually made Pinewood Close their main vehicular access, building garages next to the new road. This was an early 1970s development. This former house on the south side was the first to be completed. Hardy House stood back from the main road on a wide, irregularly-shaped plot, with a private arc-shaped drive having two entrances onto Hatfield Road. It was built for Mr Arthur H Farrington, who appeared first in the street directory in 1923, and taken over by Lt Col H M Maxwell in c1932. By 1942, the space available enabled Mr Chippington to develop a poultry business, with chicks available for sale. When the road was first numbered c1930 the Post Office numbered Hardy House as 418, with the business at 420. Around 1970 a start was made on tidying up the unused small plots tucked away from Hatfield Road at the ends of rear gardens. Hardy House, together with 410 and 412 were acquired for new housing development. In order to make a safe access away from Hatfield Road, numbers 9 and 11 Longacres were demolished and Cedarwood Drive laid out. The Hatfield Road access to Hardy House was partly blocked off. 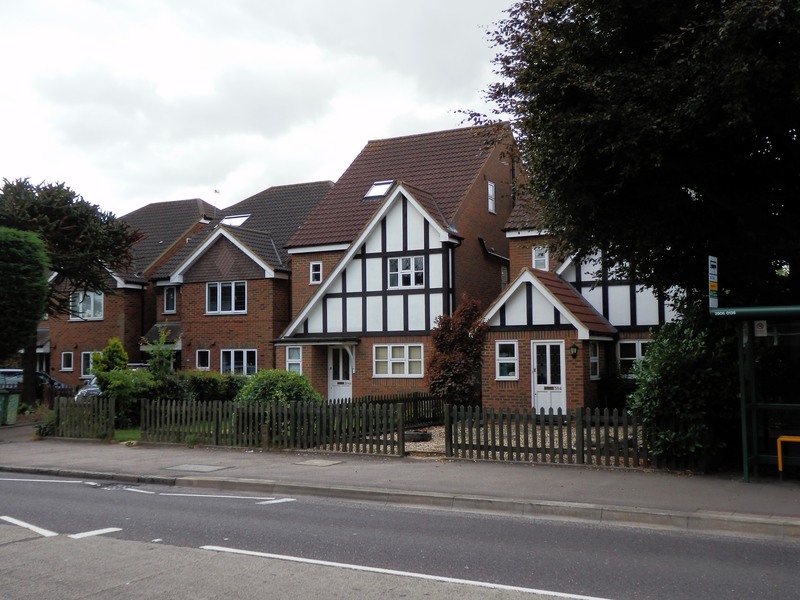 High density homes were built along the south side of Cedarwood Drive and four low-rise blocks, Cedar Court, constructed on the north end of the original plot. Cedarwood Drive was subsequently extended, parts of back gardens as far as 442 Hatfield Road having been acquired. 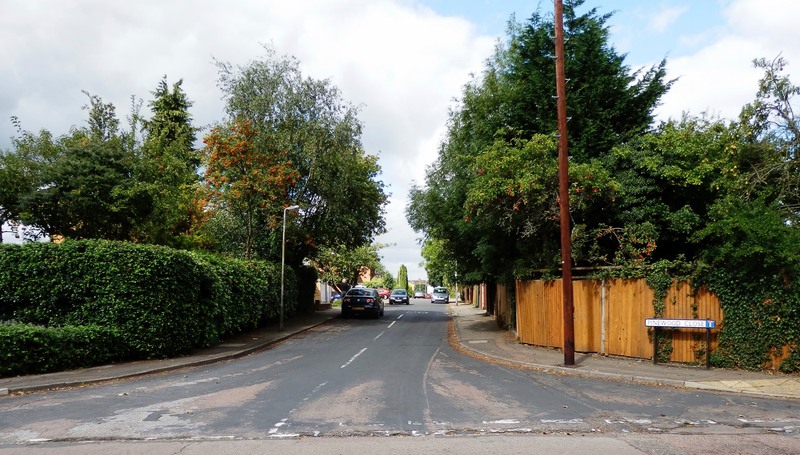 It is presumed that the owner of 448 Hatfield Road declined to have his rear garden shortened and so a separate development was enabled by demolishing a detached house, 8 Colney Heath Lane. Twenty-seven homes up to the boundary with Marconi Instruments proceeded. This road became Gresford Close. New house-building also came to the other side of Colney Heath Lane. 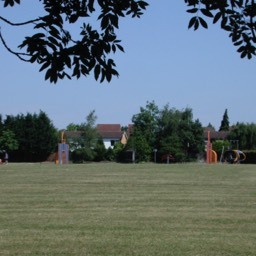 Most of the first five homes east of Colney Heath Lane are on wide plots, and again, the rear gardens are deep. In a 1980s development the wide corner house, 478, was partly used for a new terrace while leaving the house itself. An access road, St Yon Court, was laid from Colney Heath Lane. Here a small group of homes was built, leaving the remaining three Hatfield Road homes (480 to 484) in place. However, before that occurred number 486 (Trefusis), on an extra wide plot, was rebuilt as a group of four flats called Hathaway Court. Next to Hathaway Court is a narrow private drive leading to 488 (Ivanhoe), a house originally built c1930 using a substantial back plot which I will describe in more detail in the section on Firwood Avenue. When we reach 496 Hatfield Road and spot its typically 1930s square-shaped bungalow, replicated several times along this section of road, we discover a collection of individual new-build homes. 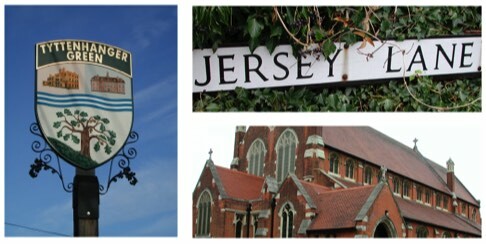 On the sites of three original plots (498, 500 and 502) have been built four new detached homes. Although two of the three originals had short gardens, possibly sold to the owner of Ivanhoe [presumably for a business which has not yet been discovered] this extra land seems to have been claimed back! This is the only example of a single property built on back land. By the time we reach this post-original development we are close to the end of the inter-war housing. 532 and 538 (numbers 534 and 536 not used) are both on very wide plots. Because there were no constraints to the rear, the land extending to the start of the former Butterwick Sidings on railway- owned land, there was more opportunity to lay out a spacious area of housing. In fact, Rowan Close backs on to Sewell Close and interleaves with the extended Firwood Avenue. So 532 and 538 were demolished in the 1960s, the original homes not having survived for more than 30 years. Number 540 (St Clements) was demolished in c1970 and redeveloped into Charlotte Close, with a replacement house close to the road, and 2 detached and 2 semi-detached pairs in the former garden behind. An original bungalow (542 Oakdene) remains tucked between Charlotte Close and the next development from c1960, Ryecroft Court. This was a land acquision using the former number 544 which had been set within a very wide plot. 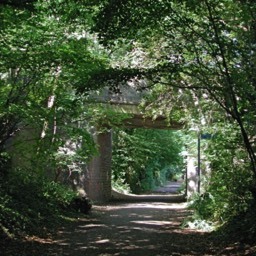 It had extended to the former track leading to Butterwick Farm and the original entrance to the early industrial area. The development is a rectangular arrangement of three blocks of maisonettes, with garages on the fourth side. Number 544 had been the final house identified on a map, though it may have included a number 548 (Morelands) which was listed in early street directories; numbers 544 and 546 appear to have been unused. Once the former track at the eastern end of Rycroft Court has been reached we have met the boundaries between Hill End Farm and Butterwick Farm. Butterwick is, at this point, an outlier of St Stephen’s Parish, even though it is enveloped on three sides by the parish of St Peter. The sale of land at Hill End Farm was, as has already been indicated, a decision of the Hill End Hospital authorities which had previously acquired the farm. 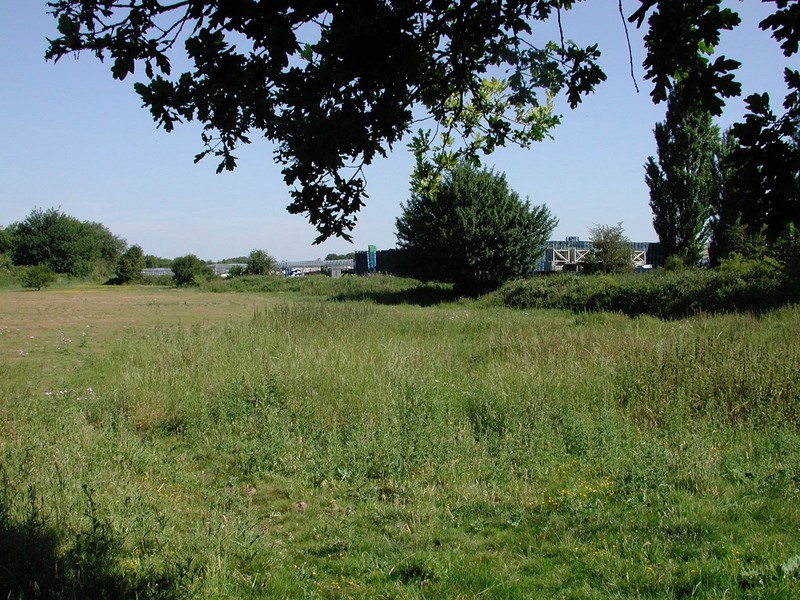 The sale of the Butterwick land, on the other hand, was believed to be an agreement made between the Gape Estates and St Albans City Council during the 1930s. While the main part of the farm was still viable, that part of it between the railway and Hatfield Road was increasingly hemmed in and physically isolated from the farm’s hub. Future council policy was to find space for industry on more spacious sites away from the city centre. Occupying land adjacent to the main St Albans to Hatfield road was seen as beneficial. 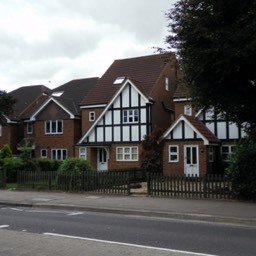 In the mid 1930s the Camp Road building firm of Goodwin & Hart purchased a sizeable site accessible from Colney Heath Lane and on it began building the semi-detached homes of Firwood Avenue. The first homes were occupied in 1939, and although most were in build or had been completed by 1940 the remainder had to wait until licences became available in the late1940s. Space was left to take advantage of back land space in Sewell Close, and although not planned for an access road it was squeezed into a narrow space at the eastern end of Firwood Avenue. Behind this five further homes were built on small plots; a separate group called Merryfields. Beyond – that is, eastwards of – Firwood Avenue is immediately encountered the homes at the south end of Cranbrook Drive. Ernie Cooper lived in Hatfield Road, close to Longacres. 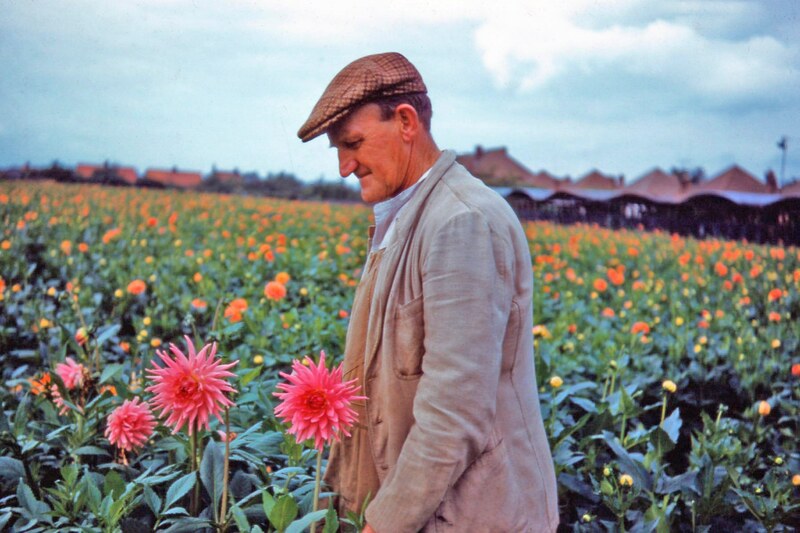 He was a keen smallholder and developed new hybrids of dahlia. 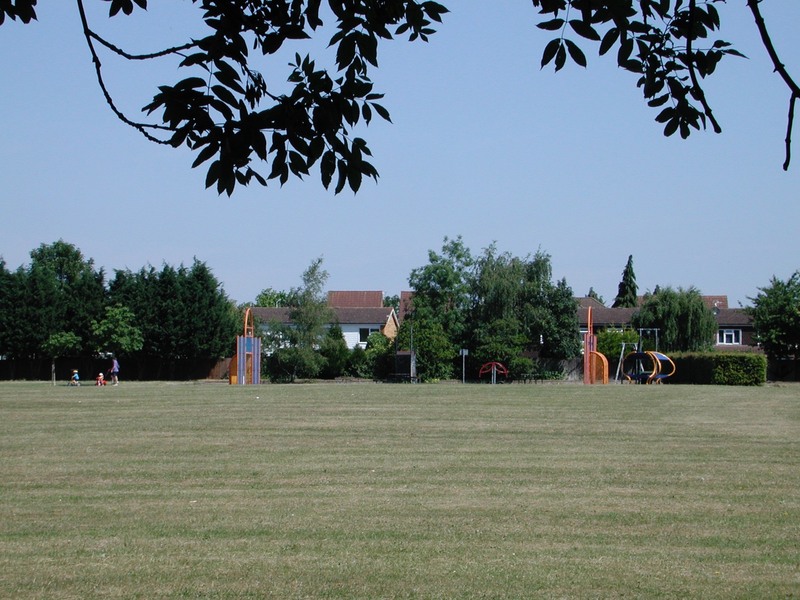 He rented land behind his house, now Longacres Park, as well as fields belonging to Roger Aylett and others. Among the most successful of his varieties were the Jescot series, named after his wife. The frontage of Ryecroft Court. View looking from Ashley Road along Oakdene towards Longacres Park.